It’s January, which is the month for wholesale gift shows. I just got back from the Los Angeles Gift & Home show where I always scour the showrooms and booths for something new for my cat lover customers. This time I found a few items that perked up my interest. 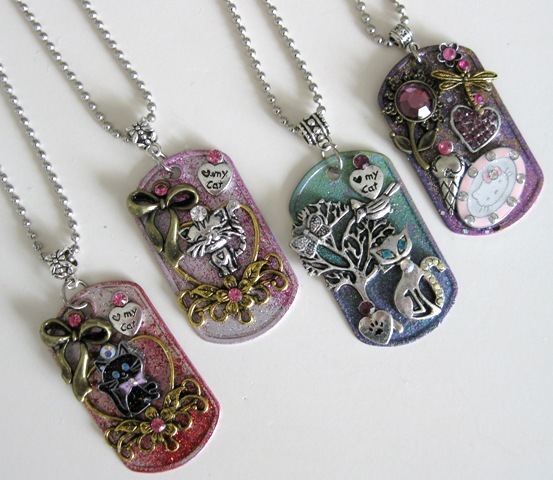 A popular type of jewelry around the show was embellished dog tag style necklaces. At one booth I saw some adorable cat & charm tags that made me stop and take a good look. 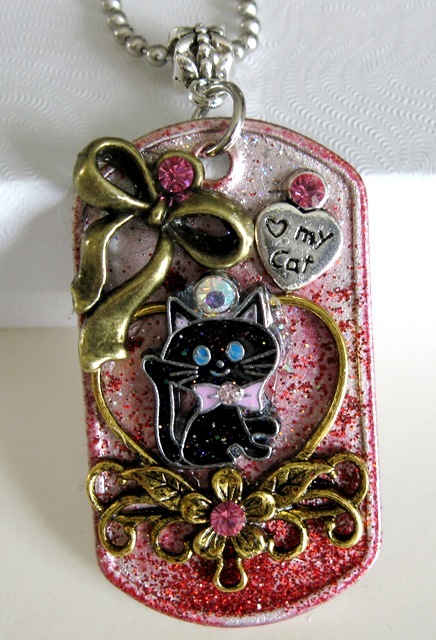 Each tag is decorated with cats, vintage & modern charms, genuine Swarovski crystals, and glitter. Being handmade, no two are exactly the same. Each pendant comes on a 24″ ball chain. The look is fun and sparkly! One note about these pendants – if you happen to want a cat with a certain theme, such as ballet, sports, etc, this can be requested. Another thing I like about this jewelry line is that it is made by a small company, owned and operated by a husband & wife team who also own a jewelry store in Southern California. I like to support entrepreneurs, especially local ones. These pendants will be on the website soon (in time for Valentine’s Day ordering, of course!). I’ll talk about another great find in my next blog. As a reminder, do you have something you would like to see on my website? I welcome all requests, just comment here, send me an email at info@georgiasgifts.com or post on my facebook page. I had no idea how impressive Hello Kitty (aka Kitty White) is on the global front! A few years ago the Japanese tourism ministry appointed Hello Kitty to represent the country in China and Hong Kong. Officials hoped that tapping into this fan base would bring more travelers to Japan and tourism has definitely grown since then. 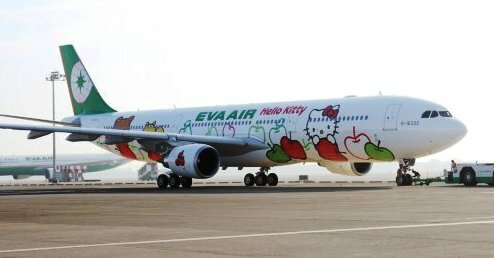 Now EVA airlines (based in Taipei) has introduced three new planes with Hello Kitty designs inside & out. Shown here is the Apple plane. Apples are a main theme in the Hello Kitty world. At check-in you get Hello Kitty boarding passes and bag stickers. During the flight are various themed goodies and the flight attendants are decked out with Hello Kitty aprons. If you are an extreme fan, there’s even a website for the airlines in chinese-language. Usually this is not my style of cat art, but I really like Hello Kitty! I do have to admit that I didn’t care too much for it when I was younger, but have become attached to it as I “matured”. (Not sure what that means about me.) I find the colors and the Japanese design influence very appealing. I’m not really a collector, but I do have a few pieces of jewelry and trinkets with the motif. 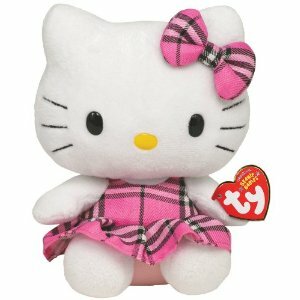 There are a multitude of products out there but one of my favorite Hello Kitty items are the plush designs by TY. Are you a collector? What are your favorites? Don’t be afraid to admit it, I did! Last week I went to an auction just to look around and I was stunned by a group of items being auctioned. Someone had amassed a huge, huge collection of antique or vintage paper valentine cards from the early 1900’s. There were even some dated as far back as the Civil War days! The first printed paper Valentines cards made in the US appeared around 1840. These were not ordinary cards – many were stand-up with bases or three-dimensional with fold out layers. Also popular because they were easy to mail were honeycomb paper puffs which opened up to form balls, bells or hearts. The collection at the auction had many of these various styles and were in very good condition with the colors still vivid. I’m not sure why they were so enchanting. Possibly because of all the history behind them? Because they were reminders of how sweet and simple life used to be? They could be called “corny” sentiments, but I prefer to see the “romance” of them. Cupids, hearts and roses were the theme of most of them, but there were also cats and kittens which I favored, of course. 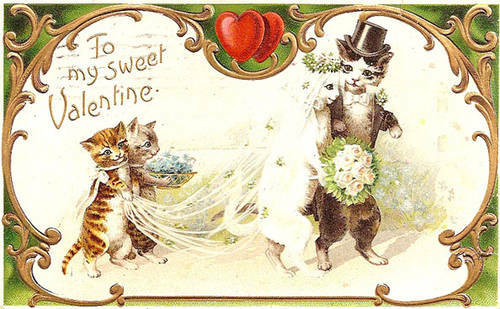 I am now thinking of starting a new hobby – my own collection of vintage Valentines of only cat styles. And I don’t mean the ones made the last few decades which are only copies of the same artwork style. While they might be cute and whimsical, I want to find authentic cards, ones that were delivered to a sweetheart from a nervous suitor, or fancy embossed fold-outs meant to impress. 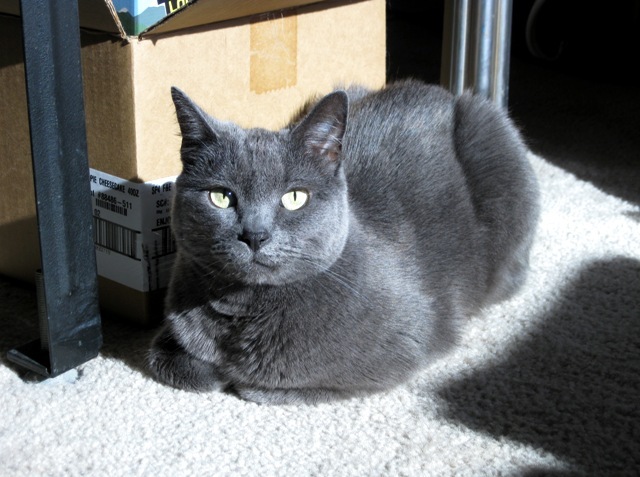 I’m on to a new quest, but I also have some great gift ideas on my website for your cat lover valentine. Check out the vintage look on some great pendant necklaces with matching earrings. Jewelry always makes a good impression on Feb. 14th! You are currently browsing the archives for the Cat Jewelry category.